Velma Jenkins, age 92 of rural Boone, died August 2, 2018 at the Eastern Star Masonic Home. Funeral Services will be Monday, August 6, 2018 at 11:00 a.m. at the First Baptist Church with Rev. Janell Bloem officiating. Burial will be in the Rose Hill Cemetery, west of Boone. Velma Lenora (Gibbons) Jenkins, was born on March 18, 1926 in Murray, Iowa the daughter of Truman and Zora (Johnson) Gibbons. Velma attended 8 years in a one room country school and attended high school in Lorimor and Murray, Iowa. Upon graduation from Murray High School in 1944, she taught two years in the same one room school she attended. Velma then attended the Mercy Hospital School of Nursing in Des Moines, Iowa and graduated as a Registered Nurse in August of 1949. She worked at the Boone County Hospital as a general floor duty nurse and also as a private duty nurse. A dedicated nurse, Velma retired her nursing license at the age of 70. On January 28, 1951, Velma married Walter C. Jenkins at Winterset, Iowa. The couple lived on a farm north of Woodward, Iowa for 6 years before moving to the Jenkins farm, west of Boone, in 1957. She helped on the family farm and lacked 4 months of being 75 years of age when she retired due to health reasons. Velma and Walter enjoyed dancing. She raised a large vegetable garden and canned and froze her produce. She was a great 4-H mom and avidly supported her childrens and grandchildrens activities and showings at the Boone County Fair and the Iowa State Fair. Velma was a member of the First Baptist Church and the Boone County Farm Bureau. After her retirement, Velma enjoyed watching television and loved being involved and attending the activities of her grandchildren. She is preceded in death by her parents; her husband, Walter in 2005; a son-in-law, Scott Besse; a brother, Wayne Gibbons and wife Betty; brothers-in-law and sisters-in-law, Dr. William Jenkins, Jr. and wife Marilyn and Dr. Hanley Jenkins and wife Marian. 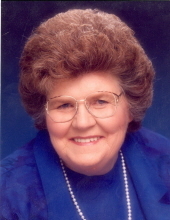 Velma is survived by a daughter, Marlene Haberer of Ogden; a son Walter Jenkins, Jr. and wife Karla of Boone; a daughter Lora Besse of Illinois; seven grandchildren, Jared Haberer and fiance, Rea Jorgaqi of St. Paul, Minnesota, Stephanie Wilkerson and husband, TJ of Waukee, Amy Schoene of Des Moines, Daniel Jenkins and wife, Sarah of Boone, Jessica Colpoys and husband, Ken of Kirksville, Missouri, Tyler Besse and Casey Besse both of Illinois; great grandchildren, Cian Colpoys, Pailsey Jenkins and a soon to be born, Jenkins girl; a brother, Robert Gibbons and wife, Barbara of Murray; several nieces and nephews. Friends may call at the Schroeder-Reimers Memorial Chapel on Sunday, from 3 until 8 p.m. where the family will be present from 6 until 8 p.m.
On Monday, friends may call at the Church from 10 a.m. until service time. In memory of Velma, memorials may be directed to the First Baptist Church or the Arthritis Foundation. To send flowers or a remembrance gift to the family of Velma Jenkins, please visit our Tribute Store. "Email Address" would like to share the life celebration of Velma Jenkins. Click on the "link" to go to share a favorite memory or leave a condolence message for the family.